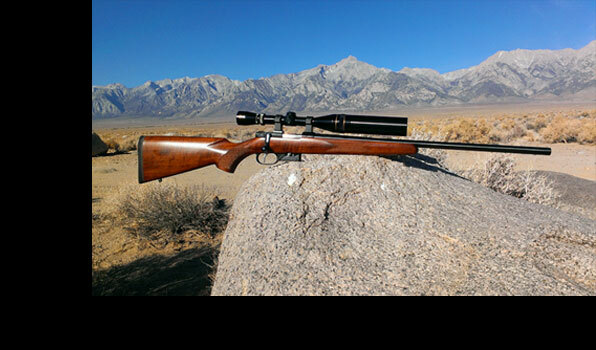 After I heard that CZ was discontinuing its fantastic Model 452 American, I decided that I would start keeping an eye out for a good deal on a 17HMR version of this rifle. 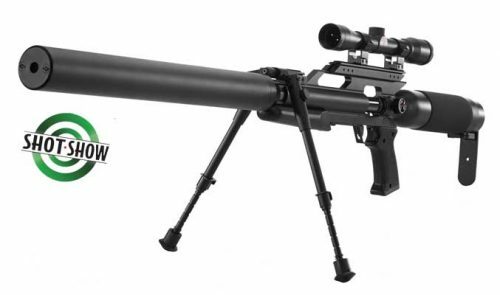 I didn’t want a “Varmint” model, instead I figured it would be a walk-around rifle, with most shots taking place while using a shooting stick. Luckily, I was able to pick one up from a small local gunshop here north of Los Angeles. I mounted a Mueller 4-14X50mm Scope on it using the very popular BKL Scope Rings. 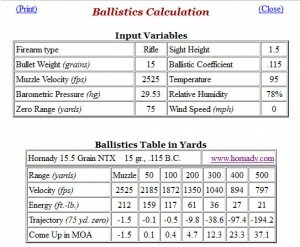 My first outing with it created an opportunity to actually sit in one spot and take shots in the 85 to 125 yard ranges. 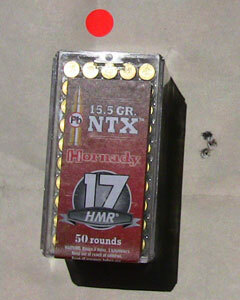 I am never surprised by the accuracy of the CZ rifles, but because I was shooting the Hornady 15.5 grain NTX (lead-free) ammunition, I was not sure if it would perform to my standards. The morning was uneventful, after leaving my home while the sun was rising, I struggled through Los Angeles traffic for a half-hour or so before the freeway opened up. A quick stop at a McDonalds on my way up had me set for the better half of the day, food-wise. I love early mornings as I am heading through the mountains north of Los Angeles. There is a calm that hits you when you realize that the millions of people within a few square miles of you are no longer there. The concerns and frustrations you have seem to melt away like the city lights in your rearview mirror. I pulled into the first ranch and was relieved that the wind was calm, making shooting conditions nearly perfect. I set-up my target at 100 yards away, then went back to my truck to set-up my shooting bench and sandbags. Once everything was set, I removed the bolt from the CZ and did a quick “bore-sight” while looking downrange towards the target. Everything looked good, so I loaded up my first magazine. One thing I received in my purchase of the rifle, was a pair of metal magazines. This was a big difference when compared to my latest acquisition, a Remington Model 591 – 5mm Rimfire. Years ago, when Remington released the 591, they decided to go with plastic magazines. CZ does the same on most of their rifles, but this one happened to come with two separately packaged CZ 5 round magazines. They were metal, heavy, built well and I was glad to have them. Once I had everything loaded, I aimed at the center bulls-eye and took my first shot. To my dismay, there was no hole on the target. I know the 17HMR leaves a small hole, so I walked down to my target to double check. Nothing! I headed back to my bench and decided to begin my sight-in like the professionals do. 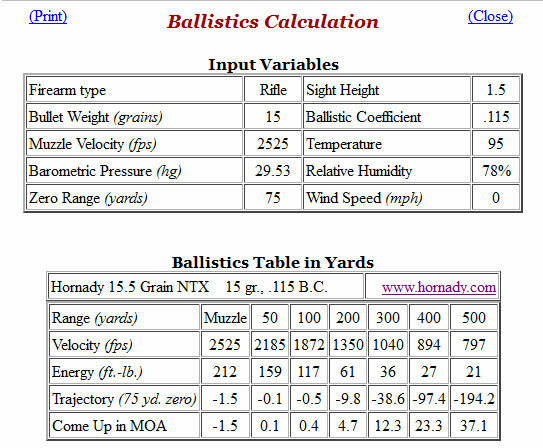 I picked a rock on the ground at about the same range of my target and took a shot (it helps to do this when your scope is dialed down to the lowest power). I saw that it hit to the left of the rock by about 12 inches. Since I had taken the Mueller Scope off one of my other rifles, I knew that it had plenty of room to bring it over to the right and dial it in. My next shot hit about 4 inches above the bullseye and to the right by about the same distance. Because I was on paper, I decided to shoot my first 3-shot group with it. Lining the mildot up with the target was easy at 100 yards, I just blotted-out the target dot and squeezed the trigger. There was a slight creep in the trigger, but nothing too bad. 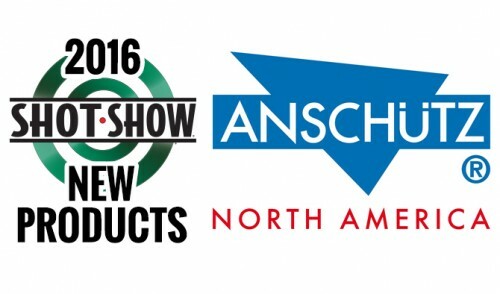 I saw the shots line-up on the target and was very pleased. Three shots were touching each other on my target. 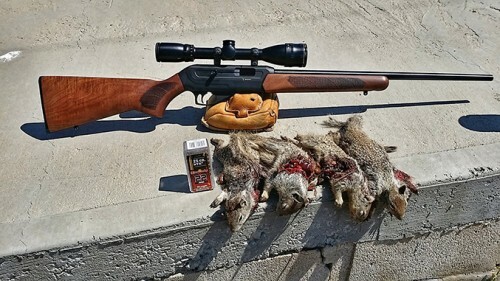 I was very happy and re-sighted to 3/4″ below the bulls-eye, which makes this round on at 75 yards, which is my typical shooting distance for ground squirrels in this area. However, I can still hold almost dead-on a standing ground squirrel out to 150 yards, if needed. I was sitting at my bench about 85 yards away from the closest stack and 125 yards away from the furthest stack. This gave me an opportunity to shoot at any targets that appeared on the edge of the trees, which happened to be the most destructive to the fruit on the trees. I won’t go into detail about each shot, but some of the highlights included a ground squirrel that was peeking at me from a hole. I had only the upper half of its head, including the eye. I took a good rest, nestling my gun against a tree, then squeezed a shot off. 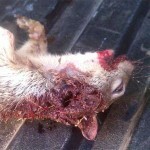 I heard the familiar “crack” of the bullet hitting the skull of the ground squirrel. 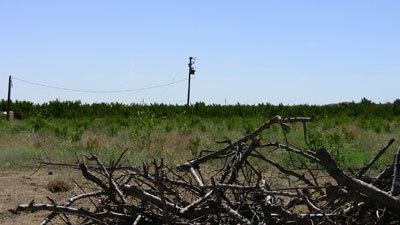 The other memorable shot was a ground squirrel sitting at the edge of the orchard at 200 yards. He was clutching a big, green peach, munching away at it like a kid eating cotton candy. I took a good rest and put the mildot on the peach the ground squirrel was holding. I then slowly moved the dot above the squirrel about 10 inches. At the crack of the rifle, I saw the ground squirrel do an aerial backflip, with the peach flying up into the air. The squirrel then proceeded to flip around for a good 2 or 3 minutes (due to the head-shot). 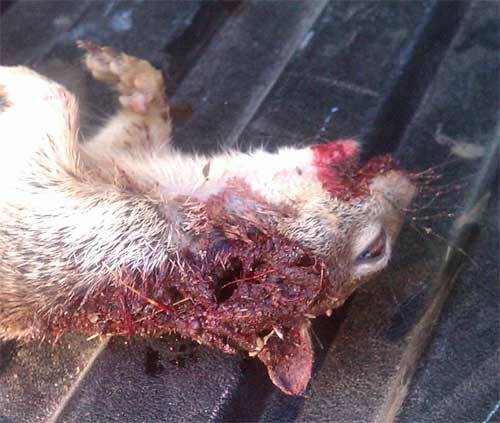 I found the ground squirrel with a bloody mouth and a hole out the side/back of its head (see image below). Getting back to my original spot near the stacks of trimmed branches. I was able to film many of the shots I took, however the heat vapors coming off the ground, coupled with the extreme digital zoom I set the camera at, caused my final video to be a bit lower quality then I prefer, but it shows some devastating shots, especially in slow-motion. 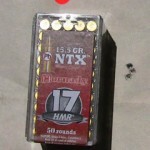 Of course you have to listen to me ramble about things for a few minutes beforehand, but I will show you some close-up images of the damage caused by the Hornady 15.5 grain NTX rounds. 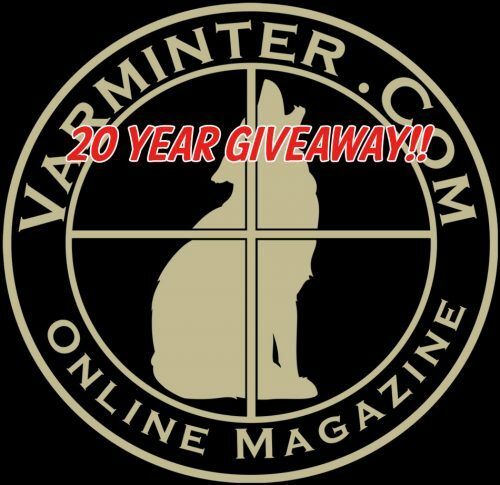 Please, join us on the Varminter Forums – We are a friendly group and love talking about hunting Varmints! !